His crimes are in light blue, bold. Because of Original Sin, Pelagius's doctrine is, of all the heresies to fall into, one of the easiest to fall into because while we are wounded creatures because of Original Sin, we desire to be good and to do good. As believers, we also desire Heaven and to keep God's commandments. 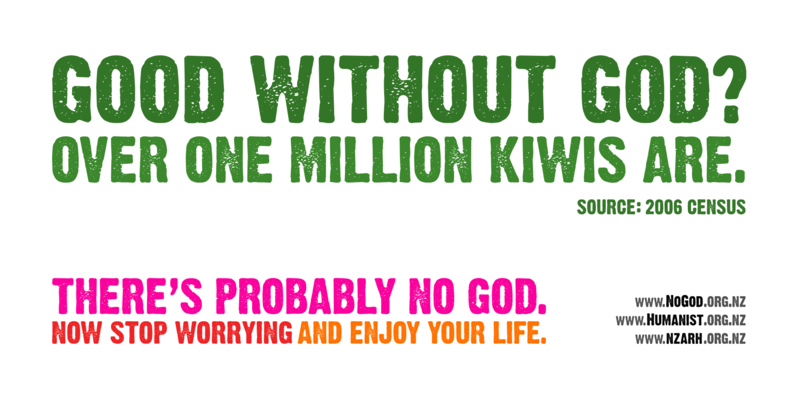 So often, however, we want to be 'good without God' (since to seek separation from God is in fact our natural human state) - or imagine that we can be, which, ironically, is what some militant atheists maintain they either are or can be - 'good without God'. As others have commented, I find it hard to understand why the accusation of Pelagianism should fall particularly at the feet of 'certain traditional communities' within the Catholic Church but we should examine why it is so. These communities were not named, so it is difficult to assess which communities the Holy Father was thinking of when His Holiness said it. It certainly opens up an interesting discussion. As far as I can see, Pelagianism, if you strip Pelagius of his asceticism, could equally be applied to the 'liberal Catholic' position, not, I hasten to add, that the Holy Father is that. If Pelagianism can be reduced to someone saying, 'I'm good without God', then the liberal Catholic falls surely into the same category because if Catholic teaching on sin and salvation is rejected, Christ's Sacrifice isn't required in that scenario either. These false ideas, His Holiness has criticised as well. Yet, Pelagianism is more than this since Pelagius was suggesting that through the human will we could merit worthiness of Heaven - a teaching that contradicts the Catholic doctrine that not only are we afflicted by the effects of Original Sin but that Heaven is always a gift from God above that is His alone to grant and of this great gift nobody, short of Our Lady and her Divine Son is worthy and even Our Lady won her unsurpassable merits from He who she bore. Yet, clearly, the human will is important to God. The commandment to 'love the Lord thy God with all thy strength, all thy heart, mind, understanding' suggests that God is not indifferent to the human will, since the will is involved in both worship and the love of God. The exercise of the human will is also involved, of course, in loving our neighbour. Christ Himself says, 'If you love me, keep my commandments'. We cannot 'keep the commandments' without the exercise of the human will. So what are we to make of Pelagius's heresy? Well, the follower of Our Lord Jesus Christ is called into relationship with Him. Jesus says, 'Apart from me, you can do nothing'. So, Our Lord calls us to greatness, virtue and holiness. He even says, 'Be perfect, even as your Heavenly Father is perfect' while knowing that this is a task entrusted to us that is impossible for us in human terms. He does not however say, that it is impossible. We could say that it is improbable, but that the Saints remind us that while sanctity is a lifelong 'labour of love', that holiness is possible. In the Saints we see the perfection of Christian charity even if they were not always perfect people. A good example is St Augustine of Hippo, Pelagius's great opponent. His 'Confessions' show us a man whose life was riddled with misunderstandings, heresies and various sins, but who, following his conversion to the Catholic Faith grows in virtue and holiness so much that he is infused with the love of God. Yet St Augustine would not attribute his wonderful ministry or his sanctity to himself or his own efforts, but to the God who he grew in his turbulent relationship with. In humility he would and did attribute any good that he achieved to God who is Infinitely Good. He also lamented and implored God's mercy for his failings. With St Augustine, it is obvious that the will is involved intrinsically in the love of God. We can see this quite clearly. Yet he, more than many perhaps in his time, had a deep understanding of the fickle, weak, stormy nature of the human will and his absolute dependence on God. St Paul, too, says, 'the spirit is willing but the flesh is weak.' And yet, both St Paul and St Augustine of Hippo 'merited' Heaven. They 'merited' Heaven not because of their heroic efforts but because of the treasury of graces they sought from the Lord. The merits they sought were not their own but belonged to Christ who dispenses them to those who 'seek' and 'find', who 'knock' and ask the Lord to open the door to them. They knew only too well that without Him, little good could be done by them. This week, His Holiness has commended to the Faithful the Holy Rosary of the Blessed Virgin Mary, asking whether those who he greeted in his homily for the Feast of the Assumption pray it 'every day' while encouraging those present to do so. 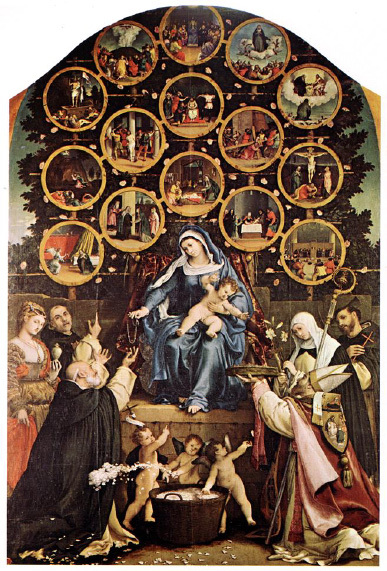 The Rosary teaches us dependence on God. 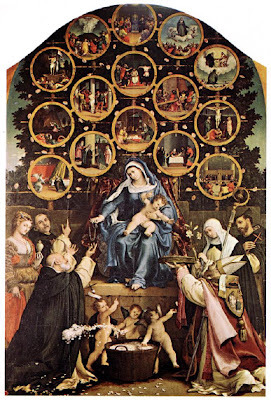 The prayers of the Rosary remind us that we are sinners in need of God's grace. The mysteries show us the truths of the Catholic Faith - that what has been wrought by God for our salvation is all because of His condescension - His abasement - in the life, death and resurrection of Christ. We 'deserve' nothing, but Christ gives us everything we could possibly desire such that it is beyond our comprehension - Heaven itself! 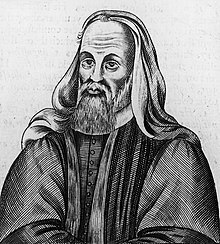 What is missing from Pelagius's teaching is Grace. We can never 'merit' Heaven but if we ever should 'merit' Heaven, it would only be because of the graces and merits of Christ that had been showered upon that we humbly accepted. The truth is that we are stubborn creatures as capable of acts of great virtue as we are of acts of great wickedness. We can easily delude ourselves, but we are weak. We carry around with us always a nature which is wounded. We can turn away from God in a moment and yet seek His mercy in another and you can bet that we will seek His mercy with less enthusiasm than that which we turned away from Him! We are conflicted creatures. We 'see the good and do not do it' and 'see the bad and do it'. We are always in a battle of wills. Shall I do God's will or shall I do my own will? Which is more pleasurable? What am I more likely to choose? Which is the easier and which is the harder for me, a sinner? The Saints are those who saw the futility of overcoming evil or vice by their own powers and entrusted themselves entirely, body and soul to God knowing that without Him they could do nothing - certainly nothing very good. Their lives were lives of surrender, abandonment to God's will because He is the all-powerful God, their own personal efforts paltry in comparison to His unfathomable grace and mercy. In the Catholic Church they discovered the unsearchable riches of Christ. Everything St Thomas Aquinas learned and then taught, he learned on his knees. Francis of Assisi only became Saint Francis of Assisi because he spent whole nights in prayer begging, imploring, insisting that God come to his aid and make haste to help him. St Francis saw that all the World had to offer him was pitiful in comparison to Christ and stripped himself of everything only so that he could be more closely conformed to Jesus and love Him without the distractions of earthly possessions and worldly pursuits. Was he a Pelagian? No. Was he deeply in love with his Maker? Yes! We hear so much in the Church how much God loves us. We know that God loves us, but how can we do as Christ has asked and love God? Our love for Him will always pale into comparison with His love for us, but only God can teach us, help us, aid us to love Him. Only God can save us from ourselves and so we should turn towards Him every day, every hour, every moment that we possibly can, so that He may accomplish in us what He desires to be accomplished in us - the transformation of poor, sinful, misguided creatures into Saints who by the infinite merits of Christ, inherit Heaven, to the glory of the Triune God in time and in eternity. It is this - this - that I have discovered by being graced by God to meet Catholic priests, monks, friars and lay persons with love for the Usus Antiquior. 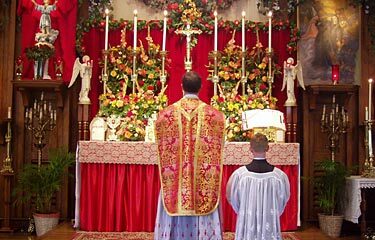 Those who I have met with love for the Traditional Latin Mass know well their weakness and know human efforts cannot win Heaven. What they do teach is that we are called into a wonderful relationship with Jesus Christ, that because of Him we can dare to call God 'Father', that we can turn to Him, that His grace and power changes our lives, that He desires to make us holy and that with His help we can love Him, that He is the prime Mover not only in the Mass but in orientating our lives towards Heaven. They teach devotion to the Real Presence of Christ in the Eucharist. They teach that we can turn our lives, our thoughts, our whole being around to Him and co-operate with Him so that we may attain to Salvation and bring the message of Salvation to all around us. Theirs is a truly missionary spirit. They have zeal. They want to save souls. Often they teach that to love and serve the poor is to love and serve Jesus Christ. They teach that in our spiritual battle with the World, with the Devil, with the flesh and with ourselves we are not just helpless, but entirely dependent on God. I don't think that is Pelagian. I think that is the fullness, truth and beauty of the Catholic Faith. We see that the word 'Pelagian' can be used lightly and yet it might mean totally different things to different people. Before he was anything else to the Church, Pelagian was a heretic who denied central teachings of the Holy Catholic Church. As well as this, falling into the trap of thinking we can 'save ourselves' or 'merit Heaven' by our own actions is something that can happen to traditional Catholics and non-traditional Catholics. In this sense, the Father of Lies does not discriminate when he perpetuates them upon God's children! The idea that we can be 'good without God' can afflict just about anybody - believers and atheists alike! The children of the Church are in danger of 'Pelagian' theology if Bishops emphasise feeding the poor at the expense of proclaiming our need for Salvation. In other words - when it comes to falling into error, it is more complicated than simply pointing to the 'traditional types in the corner of the room'. We can all fall into error and heresy. It's not hard to 'achieve'! I'll try to keep blog post short and concise, but by my own efforts I can do nothing. Oh dear Angela, that seems a bit harsh. Hysterical novellas? Well if something isn't to our taste we can always scroll on by. I don't think I have ever commented on your blog before but I have been reading it for quite a while since my conversion 3 years ago. I found this post very interesting. I can never have too many explanations of Pelagianism. And speaking generally your blogs are usually graced by wit, cogency in argument and real devotion. Thank you very much. I am intrigued by your article. It’s typical of that produced by a growing movement of lay people, asserting and explaining traditional orthodox Catholic teaching, in Continuity. I suspect this development is but filling a vacuum caused by the near total, (but with obvious exceptions, I hasten to add), absence of authorative Catholic teaching on the part of our bishops and priests. Whether this phenomena is due to lack of, or ignorance of the Faith, on their part, or embarrassment at preaching the word of God in our currently Secularist society, or because they are afraid of the emHC lot, or because they themselves just don’t believe, one can only speculate. Above all, it seems with them that sin must not ever be mentioned. That might upset too many people. Anyway, orthodox lay Catholics do seem to be increasingly important today. Maybe this is what is meant by the “New Evangelisation”? ps By the way, I do agree with most, no, on reflection, all, of what you say, so keep up the good work! The beauty about writing your own Blog is that it is your own Blog. So post what you want to post - long, sort, boring, exciting, whatever. Unless anonymous above intends to pay you, in which case you would surely comply with whatever requirements were specified. When its too long I mark it for later or don't read it. I am sure you don't mind. Keep it up. Have just seen the anonymous comment. Your articles are certainly not boring, but they can be long. You must remember that a lot of people nowadays have a very short attention span! Look, we're Catholics, right? We're not Lutherans, right? So I have a basic problem with Catholics saying (all the time, these days) 'we need lay-person leadership - the church doesn't support 'real' Catholicism'. Bones is a "proper writer". You could always print out his blost and bind it into a booklet, if it would help. Anon, please give yourself a name. Anonymous comments are not usually published. In Jacobi's defense, he nowhere said 'we need lay-person leadership'. He observed that sound orthodox teaching was coming from lay men, in the absence of sound Catholic teaching coming from Bishops and Priests. He said nothing about the Holy Father. Nowhere did he suggest the hierarchy of the Church should be revised. He merely made an observation. I must admit I'm completely confused as to why the Pope has used the word 'pelagian', but I think it must have some sort of connotation in South America that it doesn't have over here, because I notice he also used it in the CELAM bishops conference as if everybody knew what it meant. For them it seems to mean a belief that you can work your passage to heaven by following rules and regulations. In the case of "traditional Catholics" it would mean, for example, a belief that you can get to heaven by mechanically going to mass every week, receiving the sacraments, praying your rosary every day, but never actually letting the gospel penetrate your soul and change you. Its kind of similar to the way Protestants would accuse Catholics of relying on "good works" to work their passage to heaven. With other groups in the Church it might be following the rules/will of the founder in an obsessive way without actually leading a truly Christian life, as if this was enough to get to heaven, e.g. Legionaires of Christ. It's phariseeism really. ... and a scintillating perspicuous wit! Rorate Coeli on a piece on this subject, of 8 August, has comments by a PKTP and GMMF that throw light on the "Pelagianism" Pope Francis may have had in mind. A group based at Milan and Brescia in the 17th century, seen as elitists and also referred to as "Quietists". The suggestion would give a more understandable interpretation to the Pope's comments. Thanks Lynda. I'll look it up. @Bones: I love your site. No way are your blog posts too long. Was that Anonymous comment a joke and I didn't get it?